Ahriman (or Angra Mainyu) is the Zoroastrian devil, seen as an equal and opposite counterpart to the creator god Ahura Mazda. This dualistic aspect of the Iranian religion is given credit for influencing the combatant nature of Satan and Yahweh in Judaism and Christianity. Before exposure Zoroastrianism during the Babylonian Exile, the character of Satan played a much more benign part, acting as more of an informant with no power of his own to do evil things. After exposure to Zoroastrianism, though, Satan became a more powerful evil counterpart to Yahweh. Let’s face it, God occasionally acts a bit childish. Tower of Babel: In those days, the whole earth had one language … again. But, then some guys decided to build a tower, so he (it actually says they) “came down” and “confounded” their language. That’ll show ’em. Apparently none of the skyscrapers today bother him so much. (Genesis 11). Destroying Sodom: The men of Sodom were wicked, wicked I tell you! The women, on the other hand, were quite mild. So mild, in fact, that they had no problem being thrown to a mob to be raped in place of two strangers (their father generously telling the crowd, “you may do to them as you wish”-Genesis 19:8). As generous as the offer was, it just wasn’t enough: Kaboom! Dead, Baby! Yahweh rained brimstone down on Sodom … and Gomorrah, which wasn’t visited in the story but is, apparently, a suburb of some kind – Genesis 19. Kills his kid to prove a point (New Testament). He’s God, he can do anything he wants, I guess. But, in no way was this necessary. An educational film about how bad we are would have worked. Lt. Hiroo Onoda was the Japanese soldier that proved that truth was stranger than fiction with his refusal to surrender for 29 years after the end of WWII. During his time hiding in the jungles of the Philippines, many attempts were made to contact Onoda and his battalion of 3 men. Notes that told them that the war was over, come down, were left for them to find. Onoda and his men did find the notes, but determined that they were a tricks meant to deceive them. Attempts to refute the evidence come down to misrepresentation of the 2nd law of thermodynamics or outright fabrications like “irreducible complexity”. But, in the end, it all comes down to one thing. A book written by ancient people, old information, says so. The people that wrote these writings didn’t know much about the Earth; why would they? They had only seen a very small portion of it and had no instruments in which to measure things. There is no fault to be found in the ancient Hebrews, the ancient Christians, or the ancient Muslims. But, we know more about the world now. And, anyone that refuses to listen to new information is destined to be left behind while the rest of the world marches forward. Cronus was the ancient Greek god of time. He is often represented with a scythe and an hour glass … which is probably symbolic of something ominous (you know those Greeks – full of drama). 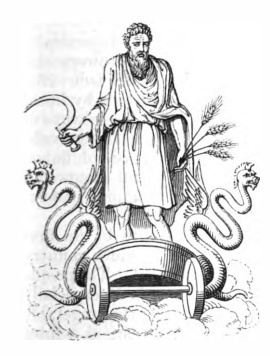 The Romans associated Cronus with their god, Saturn, because of their similarities. Cronus was the god of time in its sense of eternal duration … Cronus, having an uneasy conscience, was afraid that his children might one day rise up against his authority, and thus verify the prediction of his father Uranus. In order, therefore, to render the prophecy impossible of [fulfillment], Cronus swallowed each child as soon as it was born … Zeus … dethroned his father Cronus, became supreme god in his stead, and was universally venerated as the great national god of the Greeks. And, of course, the more conservative a person is, the more racist they tend to be, as well. Well, color me not surprised. It appears that the highly religious instinctively put people into “us/them” categories: believer/nonbeliever, moral/immoral, good/bad, black/white, etc. Link to more in depth write up.